Main Setlist: Paper Plane, Softer Ride, The Wanderer, Backwater, Mystery Medley, Gerdundula, Get Back, Get Out Of Denver, What ever You Want, In the Army Now, Somethin' bout you Baby I Like, Don't waste my Time, Come Rock with me / Roadhouse Blues, Caroline, Rockin'all over the World, Anniversary Waltz/Bye Bye Johnny. Additional songs performed: Burning Bridges sometimes in the Set. Tour Crew: Peter Hillier (Tour Manager), Andy Taylor (Sound Engineer), Dave Salt (Stage Manager/Bass Tech), Simon Rossi (Band Personal Assistant), Andrew Carman (Drum Tech), Pat Marks (Lightning Designer), Tim Franklin (Monitor Engineer), Alan "Tonto" Jhowry (Guitar Tech), Bryan Wilson (Rigger), Marcus Viner (Backline), Sue Bennett (Wardrobe), Alf Weaver (Security) Merchandiser: Niceman Europe Ltd. Management: Handle Group of Companies Manager: David Walker. Tour Note: 5 shows were cancelled due to problems with promoter or bad weather. 01/12/ UK, Aberdeen - E. & C.C. 14/12/ UK, Birmingham - N.E.C. 27.11.1995 - Status Quo kicked off their annual UK-Tour in Manchester which was called "Don't Stop". It's the name of the covers album which was due to be out in February 1996 and the tour name should say "(please) Don't Stop Status Quo after 30 years". 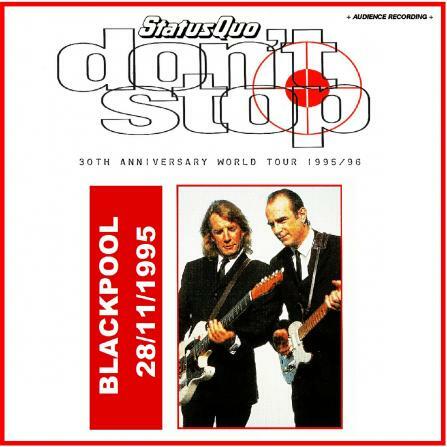 Until December 17 the band played 18 shows. Special guest are "Dear Jon". 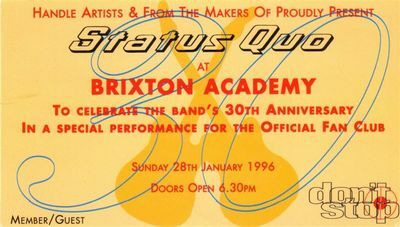 28.01.1996 - the first ever fanclub gig of the offical "From the makers of..." fanclub was held at Brixton Academy,London. 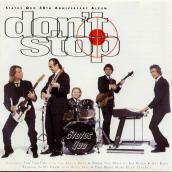 Status Quo introduced the songs of the new cover-album "Don't Stop" to around 3,000 fanclub members. 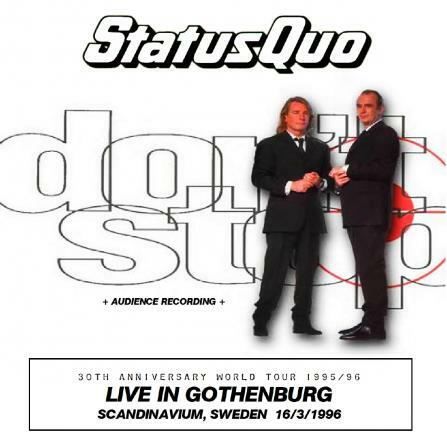 The songs were played play-back and the show was filmed and later released on video. 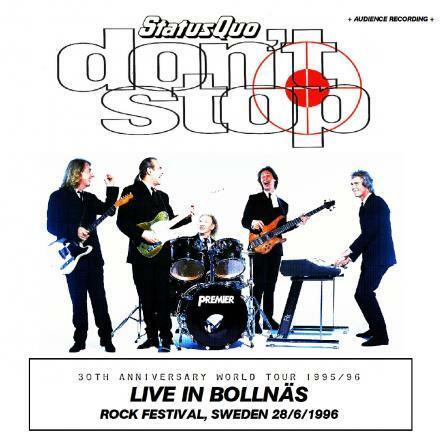 The Beach Boys were on stage to perform their song "Fun, Fun, Fun" together with Status Quo. Brian May appeared on stage when the song "Raining in my heart" was played. 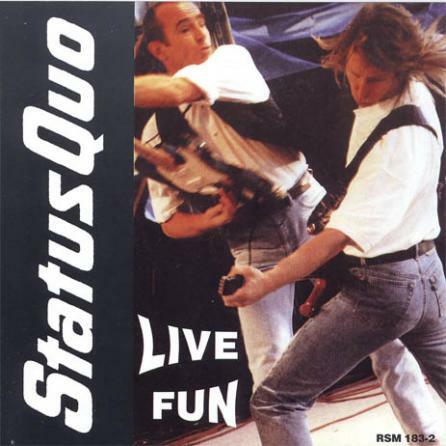 After a break the band returned to stage and played a 60 minutes Status Quo live set. Again Brian May appeared on stage to perform a stunning version of the Shadows classic hit "F.B.I" in the encore. 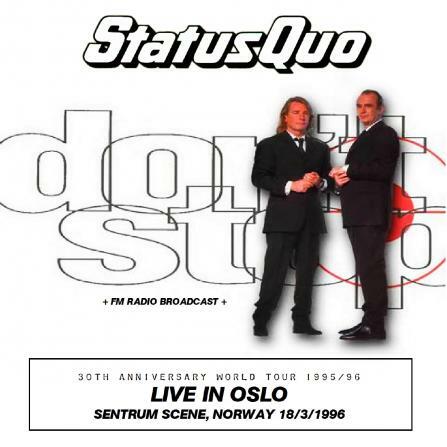 16.05.1996 - the full Status Quo show at the Phillipshalle in Düsseldorf, Germany was braodcasted live via the german radiostation SWF3 in their series "Lifetime".